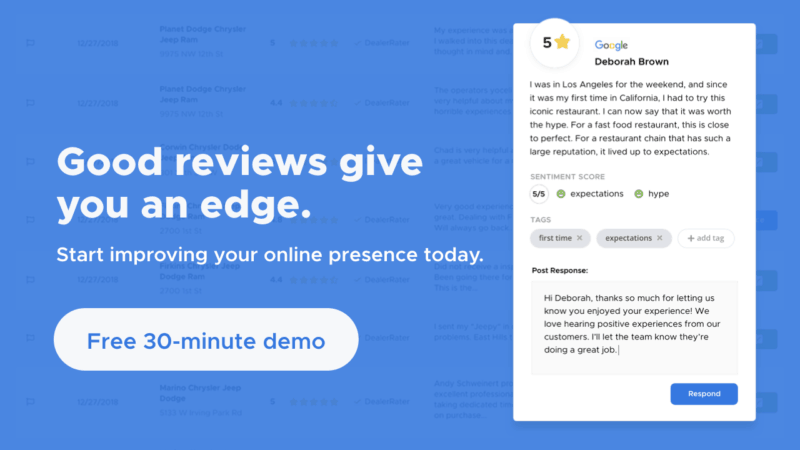 Business owners now have an easier way to edit Google Reviews. Instead of responding through the Google My Business (GMB) dashboard, owners and managers can respond to reviews directly through their listing on Google Search and Maps. They can also edit their responses. Editing isn’t a new feature to Google, but many people – as well as those managing a GMB account – are unaware that it exists. Here’s a quick dive into the feature and how customers and GMB users can use it to their advantage. Customers can edit reviews on both Google Search and Maps. Those looking at a listing on Search won’t have to spend time finding their feedback among the potentially huge list of reviews left by other customers. Clicking on the Google reviews link next to a businesses star rating opens up a smaller window that shows a small sampling of reviews. Clicking on the “Edit your review” on the top-right corner of the screen brings up yet another screen with the customer’s actual review. On Maps, the “Edit your review” link appears below the reviews section of a listing. In both cases, users can edit both the text portion of the review as well as their overall star rating. When a review is updated, there doesn’t seem to be an indicator to show that a review was edited. However, the timestamp changes to reflect the fact that it was recently edited. The fact that customers can alter their entire review means that businesses still have a chance to change the minds of customers even after they left the building. Sometimes, inaccurate information or inappropriate content is published by the business in a review response, which is not the best way to convince customers to leave positive feedback. However, there’s a quick way to fix it. Just like their customers, GMB users can also use the business listing on Search and Maps to quickly respond to reviews. An edit button will appear below the review response. Click it to open another window where you can edit the response. When you’re done editing, click the Submit button. If you want to convince your customers to update their review, you’ll need to do more than just respond to the review—you’ll need to pay attention to the customer’s pain points and actually do something about it. After taking note and fixing problems mentioned by customers in reviews, businesses should update customers of the changes through a response. After resolving the issue satisfactorily, ask the customer to update their review. Asking can be really powerful. By that same token, many consumers will update their review as long as you listened to their problem, empathized, and actually took steps to resolve the issue. A Google update now alerts reviewers whenever you respond to their review. Because your customers get an email informing them of your response, there’s a good chance your customer will actually read your response and consider your request to update their review. So it’s on you to ask. Take a look at the review below from a disgruntled customer about their experience at a vehicle service center. The store owner saw the feedback and responded. 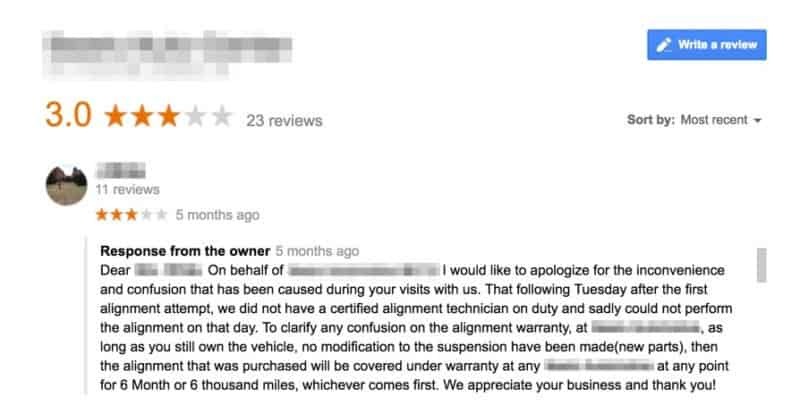 Not only did the owner apologize in their response, but they also clarified an issue brought up by the customer and thanked them for their business. The detailed response had an impact on the customer. Their increased their rating from one star to three stars. Apologizing and resolving the issue was enough to change the customer’s perception for the better. Reviews on Google have more impact on customers than other review sites. Our survey shows that 63.6 percent of people are likely to check Google reviews before they visit a business. That stat alone should make businesses pay more attention to Google reviews, and more importantly, respond to negative feedback. There’s an opportunity to convert 1- and 2- star reviews to a 3-, 4-, or 5-star rating. These changes make the review more recent, which helps bring in customers. Keep in mind that 77 of consumers believe that reviews older than three months are no longer relevant. There’s an even smaller group, 18 percent, that are only interested in reviews from the past two weeks. Responding and getting improved reviews is a great way to differentiate yourself from the competition. Consider this: 63 percent of people in the online reviews survey said that a business never responded to their review. By responding and getting better reviews you’ll set yourself apart from the competition.